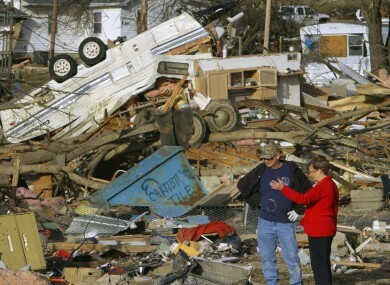 Winds of up to 270 kph tore through neighbourhoods, destroying homes in the Midwest and killing at least 12 people. Surveying the storm damage in Harrisburg, Illinois. AT LEAST 12 PEOPLE have been killed in a series of severe storms in the US Midwest yesterday. The storm system started over Kansas before moving eastward across five more states, killing six people in one incident in the Illinois town of Harrisburg when a block of houses were destroyed. The Chicago Tribune reports that wind speeds in Harrisburg reached 270 kph. The storms have since dissipated but they caused significant damage to the towns and villages in its wake. Illinois Governor Pat Quinn has declared a state of emergency in Harrisburg. Meanwhile in Missouri, Governor Jay Nixon has also declared a state of emergency following last night’s storms which killed three people in his state. He said that the “state of Missouri will assist at every stage” of the emergency response and recovery efforts. Email “12 killed in severe US storms”. Feedback on “12 killed in severe US storms”.